Left untreated, a malocclusion not only affects the patient's appearance, it can also cause severe health effects. 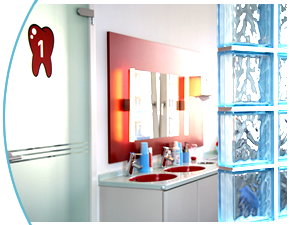 Besides routine orthodontic care, our wide range of treatment includes a variety of auxiliary services. After an appropriate examination and consultation, we will decide - together with you – which treatment is the best for you. For children under 18 years of age, the statutory health insurance covers all treatment costs subject to the so called KIG system (German abbreviation for: orthodontic indication group), a classification of the different forms of malocclusion. With a certain degree of severity, the health insurance covers the costs of treatment. The patient’s own contribution during treatment will be paid back by the health insurance after the treatment has been completed successfully. Certain materials and services that comply with the latest standards in orthodontics are not completely covered by the insurance. We offer those as additional materials / services at private expense. Orthodontic treatments for adults are normally not covered by statutory health insurance. So you have to bear the expenses for treatment yourself, unless a combined orthodontic and surgical treatment is necessary. Here the same conditions apply to adults as to children. The patient’s own contribution during treatment will be paid back by the health insurance after the treatment has been completed successfully. Here too, certain materials and services that comply with the latest standards in orthodontics are not completely covered by the insurance. We offer those as additional materials / services at private expense. The same applies to patients who are eligible for government allowances. Here too, orthodontic treatments for adults are not covered by insurance unless a combined orthodontic and surgical treatment is necessary. Whether or not the insurance covers the costs of the treatment for privately insured patients depends on the individually agreed tariff. This applies to children and adults. The costs can either be covered totally, partly or not at all. Please talk to your insurance agent before we start the treatment. Of course, we are always there for you and will support you with our knowledge. Moreover, the legal restructuring of dental tariffs at the beginning of 2012 resulted in the fact that certain materials and services that comply with the latest standards in orthodontics are not completely covered anymore by private insurance companies. Of course, we will give you professional advice about existing possibilities. Government allowances are only granted to patients up to 18 years of age. Here too, orthodontic treatments for adults are not covered by insurance unless a combined orthodontic treatment and jaw surgery is necessary. Moreover, the legal restructuring of dental tariffs at the beginning of 2012 resulted in the fact that certain materials and services that comply with the latest standards in orthodontics shall no longer be covered completely by government allowances. Of course, we will give you professional advice about existing possibilities. Whether or not your additional insurance covers the costs of the treatment depends on the individually agreed tariff. Please talk to an agent of your additional private insurance before we start the treatment. Of course, we are always there for you and will support you with our knowledge.